Left: Vedika proud of her sushi platter, with Chef Amit. 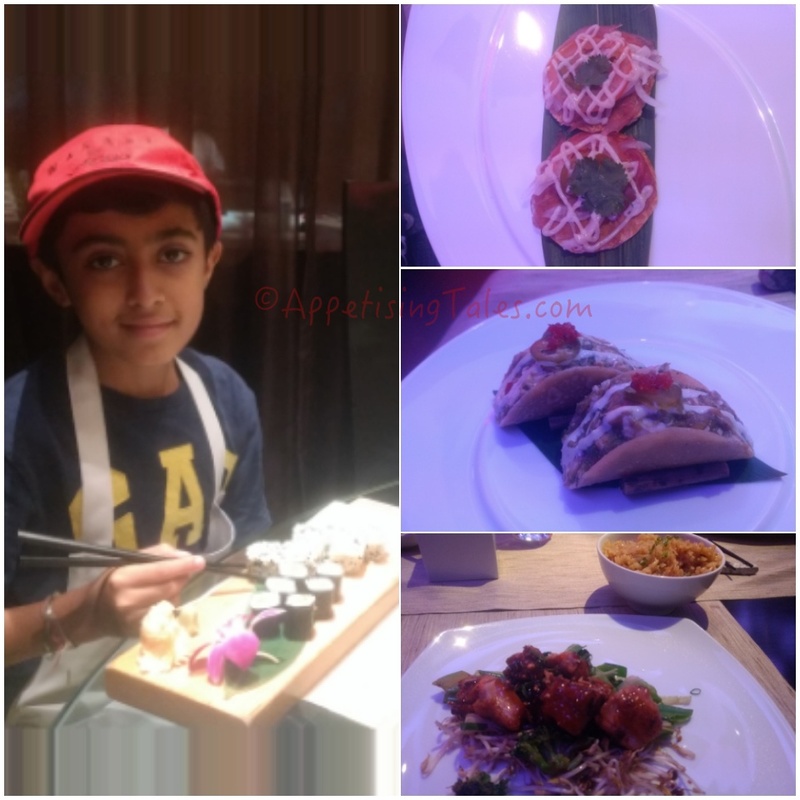 Right: Nirvaan with his prawn tempura roll. Frequent travel overseas, availability of international ingredients in India, streaming of international food-based shows and of course the proliferation of diverse restaurants in major cities are just some of the factors responsible for the evolving palates and eating preferences of Indians. Interestingly, this is not limited to adults. Even children are widely exposed to international cuisines due the same reasons. Last year, Chef Manish Mehrotra had talked about the focus on Kids’ Menus for my article on food trends for the coming year. I was reminded of Chef Manish’s comment when I recently visited Wasabi by Morimoto with my kids, aged 11 and 8 years. Not only does this fine-dining Japanese restaurant have a special kids’ menu they even conduct Junior Masterclasses. Nirvaan and Vedika (my kids) participated in a fun-filled sushi rolling class on the weekend preceding Children's Day. These masterclasses are conducted regularly and are limited to 8 participants to facilitate interaction between the chef and the kids. Our masterclass started with an introduction by Chef Amit to commonly used ingredients like kombu, nori, sushi rice, sushi vinegar, different garnishes, wasabi and fish roe. While he encouraged the kids to taste some of the ingredients it was interesting to note that most kids were familiar with quite a few of them. 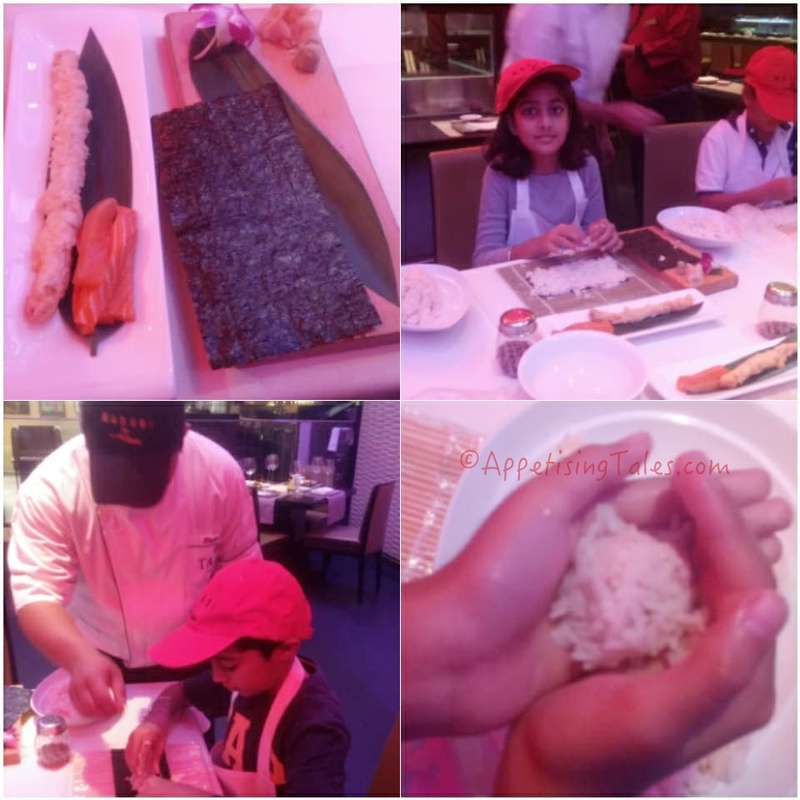 The kids’ enthusiasm was palpable as they shared their memories of their first-ever wasabi kick, showing off knowing the difference between salmon roe and flying fish roe and so on. Creating culinary memories and making new friends. The kids then moved to a table that was set with individual counters. Each of them got a bowl of readied sushi rice, a platter with nori, prawn tempura and salmon slices, and a bowl of ice water. As the demo started, the kids dipped their hands in ice water and got started with picking up the rice, rolling it into a ball and spreading it onto the sheet of seaweed. The process was fun, messy, and fairly easy with ample assistance by supervising chefs. Each of them made prawn tempura uramaki (rice outside) and salmon hosomaki (seaweed outside). The chefs did the slicing of the rolls since the knives are too sharp to be handled by kids. Finally the kids proudly placed the sushi made by them on platters decorated with orchid flowers. Four of the five courses. 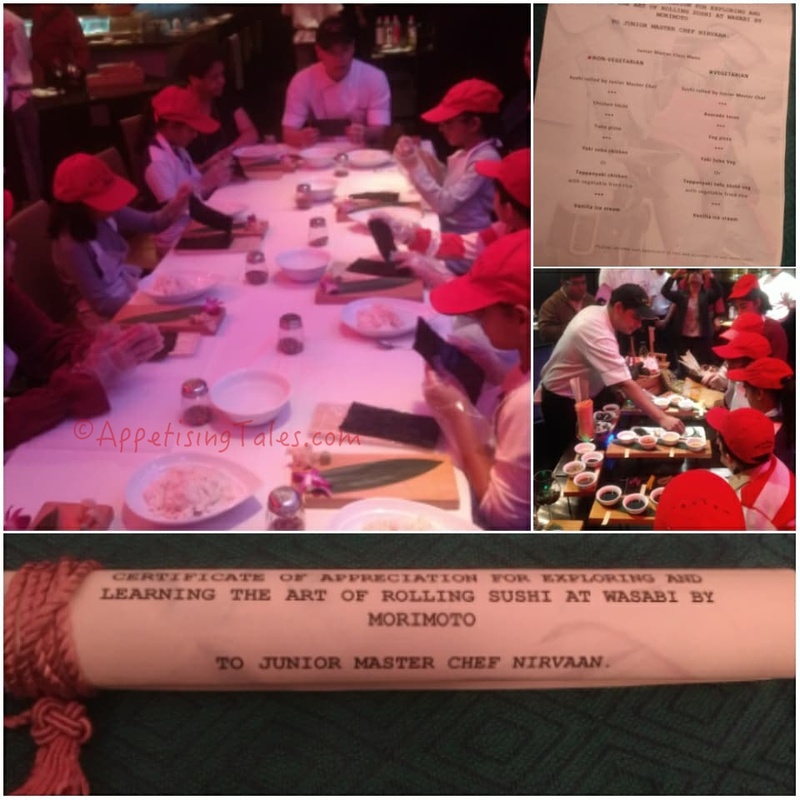 The menu is presented as a customized ‘Certificate Of Appreciation For Exploring And Learning The Art Of Rolling Sushi At Wasabi by Morimoto’. 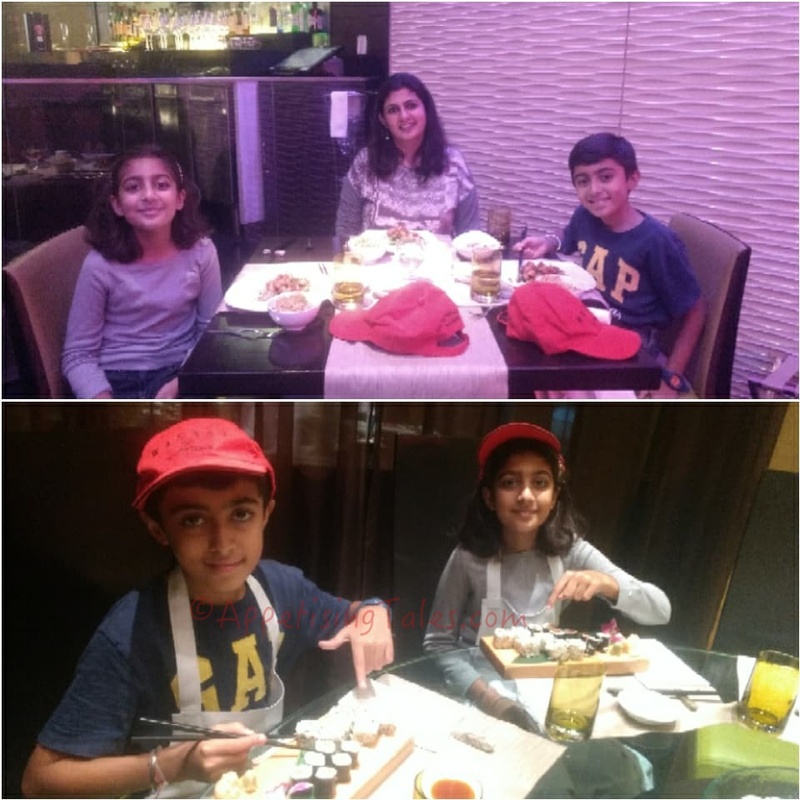 The two rolls of sushi made by the Junior Masterchef is the first course followed by chicken tacos, tuna pizza, teppanyaki chicken and fried rice or soba noodles and vanilla ice cream. Each item is delicious and appropriate for kids, and all together it is more than sufficient for even someone with a big appetite. Moi with my Junior Masterchefs. This experience including the lunch costs Rs 3,000++ per child. 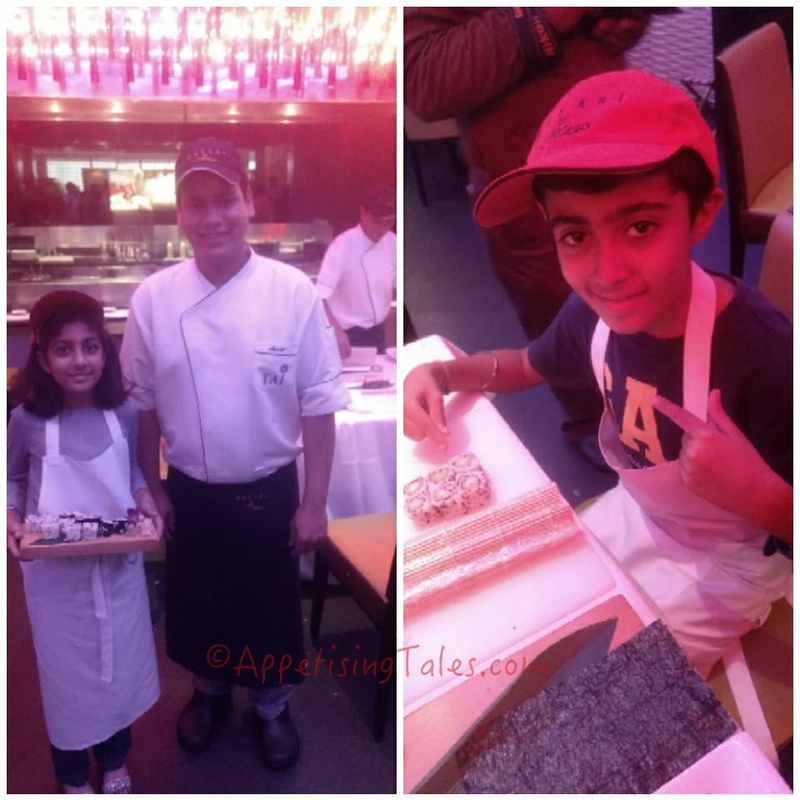 Accompanying adults get a three-course lunch including shira ae, chef’s special sushi and teppanyaki chicken at Rs 2,000++. Memories created in the process are priceless!